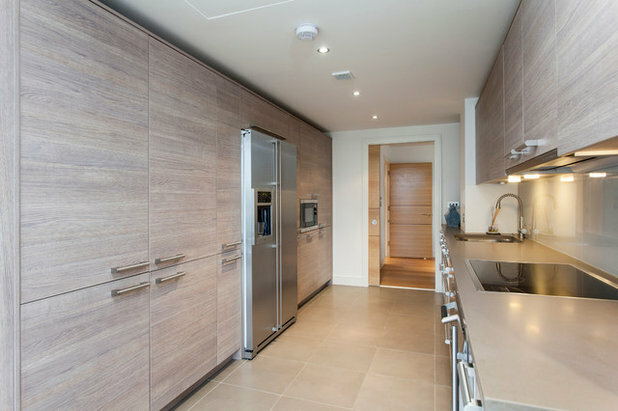 A galley kitchen consists of two parallel runs of cabinets forming a central corridor within which to work. 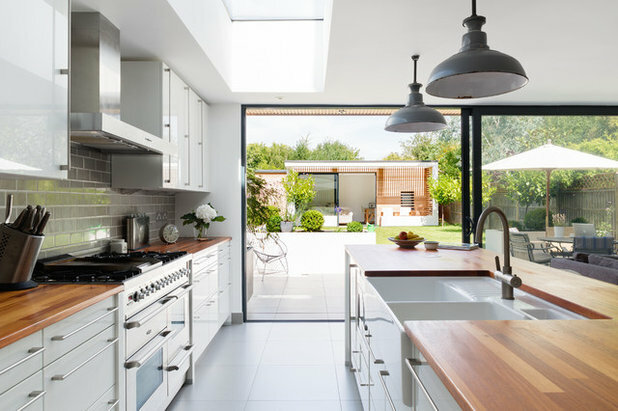 The galley layout works well for all kitchen styles; it’s also the preferred design of many professional chefs, who love this layout because it enhances safety and efficiency during cooking. 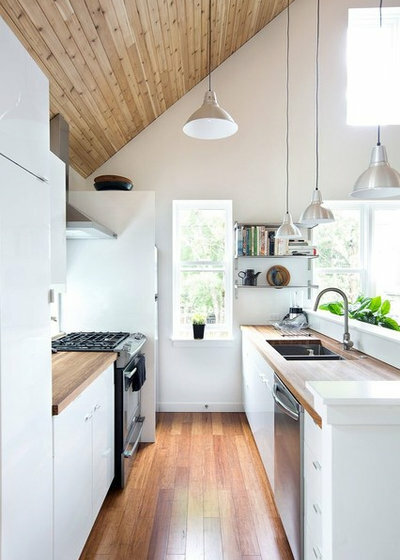 Just like the compact galley on ships, after which this layout is named, galley designs also optimize space by packing in an abundance of storage and countertop area, making them ideal for small kitchens. If you’re considering a galley layout or are revamping one you’ve inherited, here’s what you should know. Choose your preferred galley look: Symmetrical. 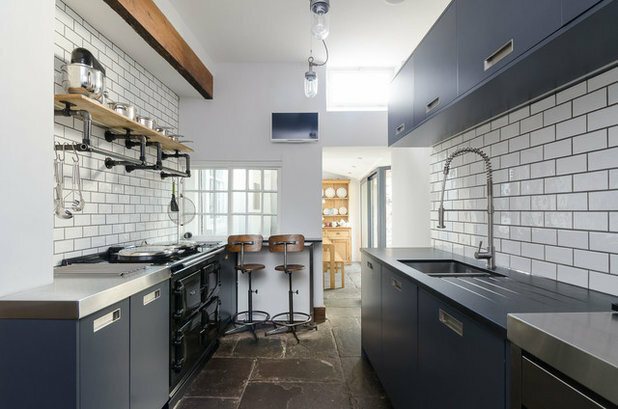 When it comes to galley kitchens, people have two layout preferences. The first is relatively symmetrical, as pictured here. This usually means that the length of the runs and the arrangement of cabinets on each side will mirror each other as much as possible — or as much as you want. Asymmetrical. 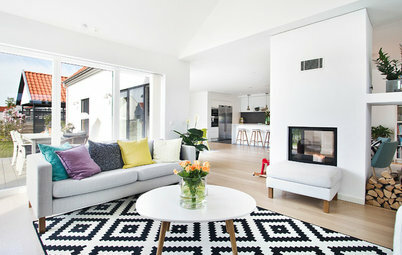 You can opt for an asymmetrical layout instead, using various approaches. 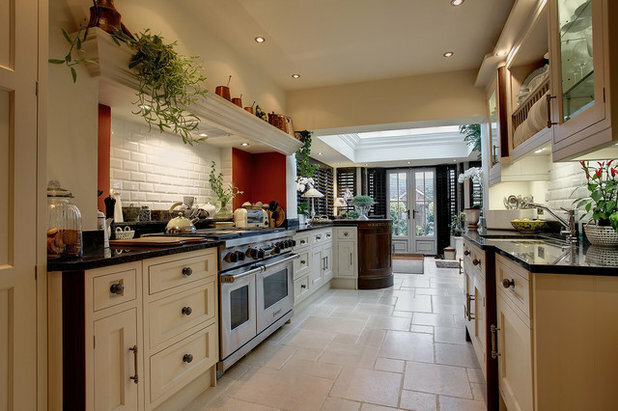 For example, if you have an open-plan space, as pictured here, you can go for a mix of tall and upper cabinets along one side, with a run of only lower cabinets on the other. 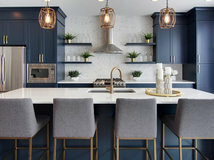 Or you can put tall cabinets or a bank of appliances on one side of the room, with lower and upper cabinets on the other side, as in the next image. Put tall cabinets on one wall. 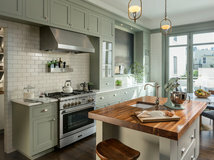 If you’re designing a galley kitchen like the one above, it’s preferable to go for a wall length of at least 12 feet so that the sink and cooktop can be placed far enough away from each other. 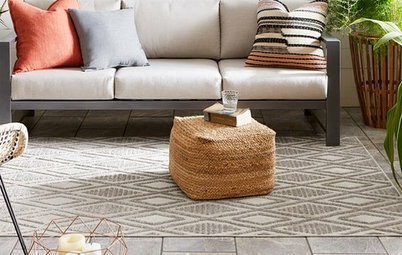 For safety, these should be a minimum of a foot apart, but since this wouldn’t leave any working space, we always try to site them more than 3 feet apart. In this arrangement, a run of about 12 feet would allow sufficient sink capacity, with cupboards or drawers beneath the cooktop — occasionally adaptation is required for top drawers in this scenario — and it ensures that all major appliances fit. Finally, 12 feet allows space for the units on the opposite run: the fridge, oven housing and pantry storage, for example. This arrangement provides ample storage space, helping to keep the kitchen tidy and the countertops clear of clutter. Break up the run. You may prefer an asymmetrical layout with full-length and lower cabinets along the same wall. For example, if a wall is just over 12 feet long, it’s likely to have three full-length cabinets at one end and three lower cabinets at the other. 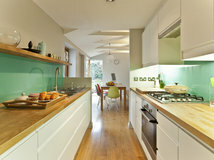 Typically, there would be upper cabinets, floating shelving or a window above the lower cabinets. 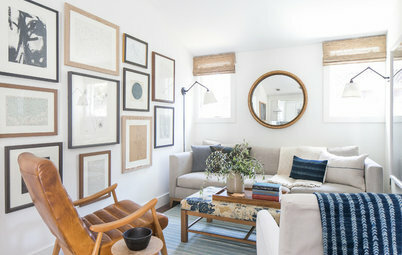 Along the opposite side, you could have upper cabinets, shelving, a window or even a clear wall. 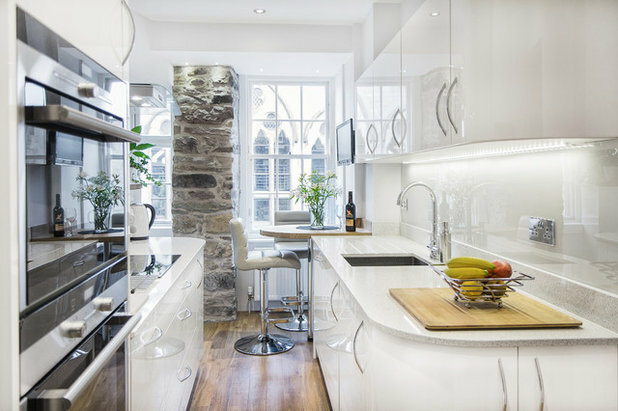 This arrangement works really well if the kitchen is quite narrow, since without a tall bank of cabinets as you enter the kitchen, the space will feel more open. Work with a galley corridor. 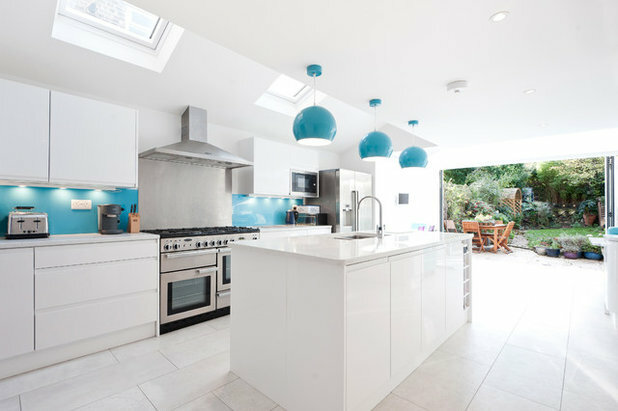 Depending on the layout of your home, galley kitchens may or may not be closed off at one end. If the far end leads to another room or the garden, the thoroughfare will get heavier traffic. Depending on the number of people in your household, this may not be a problem, but if you have young children or pets, you won’t want them charging through the kitchen while you’re holding a sharp knife or pan of boiling water. 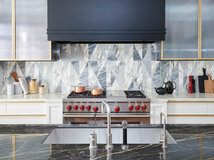 You can enhance the safety of your layout — particularly where the corridor is very narrow — by planning your kitchen with the sink and cooktop on the same run. While less efficient than having them opposite each other, this arrangement focuses your appliances in one area, so you won’t have to turn to the opposing run with potentially dangerous kitchenware in your hands. Enhance a closed-off kitchen wall. 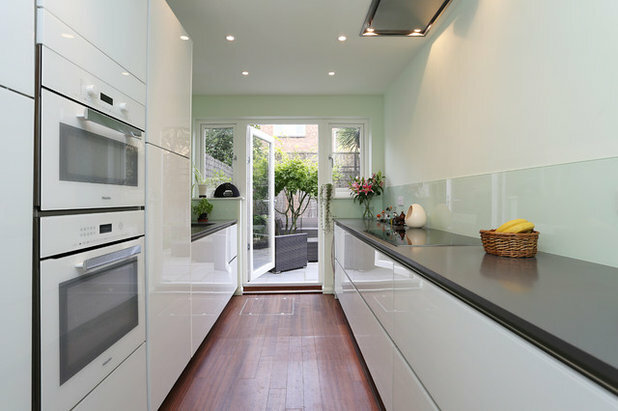 A galley kitchen closed off at one end can be a safer layout, as there’s only one entrance, giving the cook greater awareness of others coming and going. But how to make good use of this wall space? Perhaps there’s a window here, in which case it’s important not to block your kitchen’s natural light source. 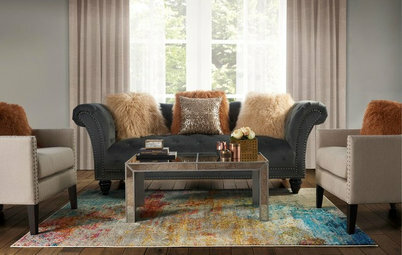 Adding a stool would let you sit at the far end to write shopping lists or to sit while chatting on the phone. 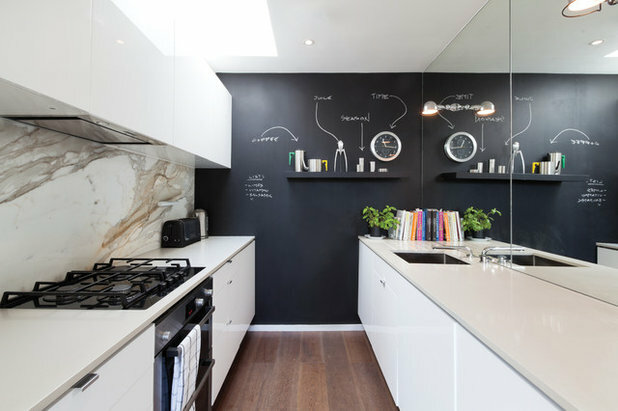 Alternatively, there may be room for open shelving, a nice painting or maybe a family-friendly blackboard wall, shown here, which can be used for playful drawings and notes, or for shopping or to-do lists. The clever use of the mirror on the right side of this compact kitchen is also worth noting; it creates the impression of a bigger space. Create a galley with an island. I’ve mentioned that enclosed galley kitchens may not be the most sociable setting for the cook. 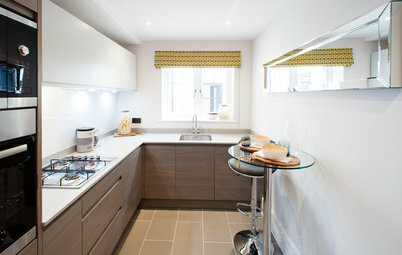 So where space allows, a popular adaptation of the galley kitchen is the inclusion of a kitchen island. 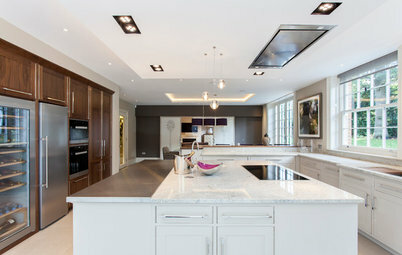 In this instance, the island replaces one of the runs to become part of the kitchen’s layout and functionality. The island sits parallel to the longer run of cabinets and typically houses either the cooktop or the sink. Whichever is not positioned here would be staggered on the opposing run rather than directly opposite. This staggering is safer and more efficient during cooking because it reduces the distance required for the user to turn between the sink and cooktop. Make your galley sociable. 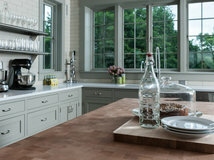 Some homeowners want to add an island to a galley layout, yet intend to keep the additional work surface clear. This is often the case with bakers, who like to use the space for rolling out pastry. 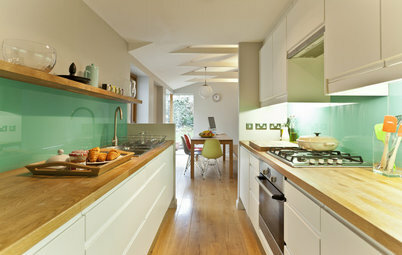 If there’s space to add a table between the opposing runs of your galley kitchen, this can sometimes work. 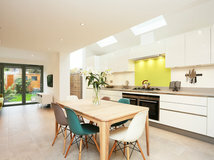 However, you need to be careful when planning the space because, if the table pushes your work surfaces too far apart, they’ll be much less efficient. Adding a small cart as an extra work surface may be an effective alternative, although in most cases, there’s sufficient counter space in a galley to eliminate the need for this — unless it’s a specialized addition like a butcher block. 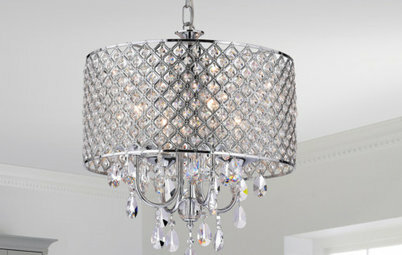 Enhance a sense of space. 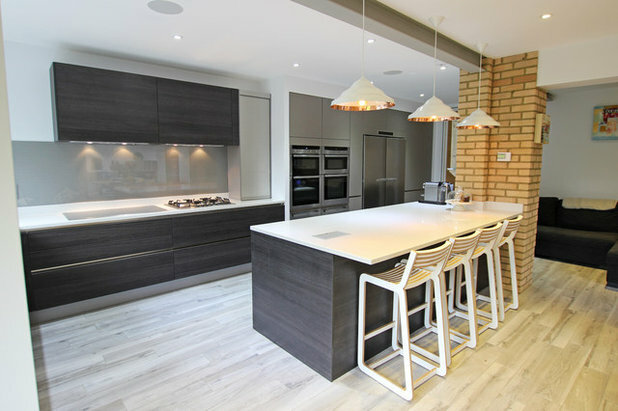 When considering a galley kitchen layout, homeowners are eager to avoid a “corridor” effect, where the kitchen feels small and enclosed. But even in small spaces, this can be avoided. As already mentioned, losing the continuity of tall cabinets in favor of upper cabinets or shelving will help open up the space. The choice of furniture also helps: High-gloss finishes in pale colors are best for reflecting light and enhancing a sense of space. 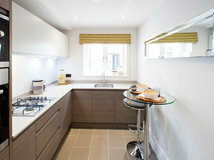 Similarly, handleless doors and drawers are clean-lined, and they take up less physical space than handled ones. Finally, lighting is important. 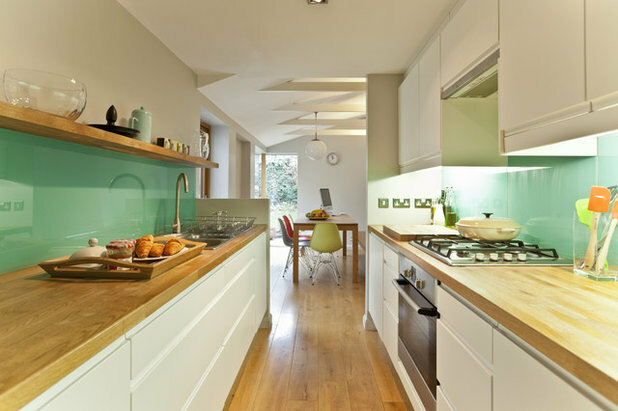 Well-placed and oversize lighting will soften the kitchen’s look and create the impression of more space. Tell us: Do you have a galley kitchen? If so, what do you love — or what would you change — about your layout? Share your thoughts in the Comments. 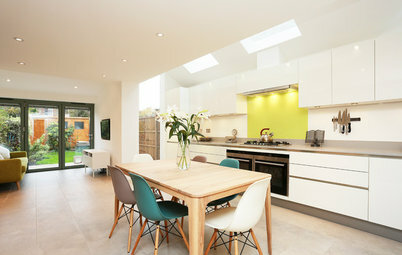 I'm liking the look of kitchens without wall cupboards more and more, they look cleaner, more open and somehow more natural. Trundling a lonnng way back in these comments...what is a "Stick Victorian"? My favorite kitchen was my galley kitchen, Its been a long time so I’m not sure of the dimensions, but I would say mid sized. Lots of countertop and cupboards. One side opened to the formal dining, one side for the family dining, home office side. Plenty of room for meal prep and the yearly jam canning.